the whole body look and feel younger. The Facial Acupuncture treatment is based on the principles of Chinese Medicine and involves the insertion of hair-thin needles into the skin along channels or meridians of energy called Qi (pronounced chee). Specific points are chosen to manipulate the movement of energy in the body according to the individual’s needs. Thousands of years ago the Chinese discovered that many meridians either begin or end on the face while some have internal branches that go to the face. Thus practitioners of Facial Acupuncture know how to specifically affect the face while simultaneously treating the underlying factors that contribute to the ageing process. Who would benefit from Facial Acupuncture? Anyone who wants to stay looking and feeling young and is looking for a way to slow down the ageing process naturally. Facial acupuncture not only treats the face but addresses the body’s underlying health imbalances which can contribute to the ageing process. 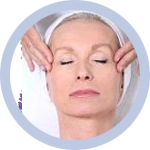 Treatment is tailored according to how an individual is ageing. For example a person with puffiness would require a different treatment to someone with dry skin. The whole person is treated and evaluated on the mind-body level – the foundation of holistic medicine. A 1996 report in the International Journal of Clinical Acupuncture reported that among 300 cases treated in China with facial acupuncture, 90% had marked effects with one course of treatment. Effects included: improvement in skin texture and colouring, increased elasticity, reduction of wrinkles and overall rejuvenation, not merely confined to the face. Though not a cure for wrinkles, fine lines may be eliminated, puffiness of the face reduced or banished, facial colouring equalised (whether too red or too pale), drooping eyelids lifted and double chins toned. With the increase in circulation of blood and qi to the face, and stimulation of the movement of lymph, skin texture and colouring improves, muscle tone improves, pore size is regulated and a reduction in stress is evident in the face. Techniques also exist to eliminate broken capillaries and rosacera may also respond to treatment. The treatment should be performed by a licensed acupuncturist, who is properly trained and insured, and who belongs to a professional organisation with clear codes of safe practice and professional conduct. Not all acupuncturists are specially trained in Facial Acupuncture. What is a course of treatment? Generally a course of treatment consists of 6 weekly sessions. Each person responds differently depending on his or her condition and lifestyle prior to and during the treatment series. Usually the effects become most noticeable by the sixth treatment. The aesthetic benefits can sometimes be observed sooner or even in the first few sessions, but it is most common, because the effects of acupuncture are cumulative, to see the benefits towards the end of the course of treatment. Following the initial course of treatment, maintenance sessions can prolong the results for five to ten years. These subsequent treatments help to ensure the magnitude and duration of the effects from the course.